The artist Carine Brosse transforms the phone box into an enchanting world of strange flying creatures. Made out of collage and mixed media, the inhabitants of this magical space are a display of colour and cheerful exuberance. Carine is a multi-disciplinary artist, whose previous work has included large scale outdoor installations for the Grassington Festival. 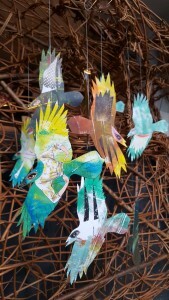 But on this occasion she is using collage and mixed media within the confines of the gallery’s limited space. Born in France, Carine moved to the UK at the age of 20, eventually settling in Grassington. 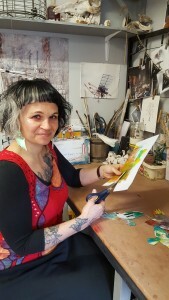 She took a degree in fine art at Leeds Metropolitan University and now runs the Wishbone Gallery in Grassington with ceramicist David Ashby. The two each have a workshop on the site. Over the past 13 years Carine’s work has been included in thirty different exhibitions, mainly across Yorkshire but including the Leeds Revised show in Dortmund Germany.